Dear Readers: Several times a year, Bruce Mehlman releases a fascinating PowerPoint presentation filled with interesting nuggets about American politics and government. Mehlman, a Republican lobbyist with the bipartisan firm Mehlman Castagnetti Rosen & Thomas, is a University of Virginia Law School graduate and friend of the Crystal Ball. Because we get so much out of his presentation, which often cites Crystal Ball data, we thought we would link to it here so that readers could take a look. 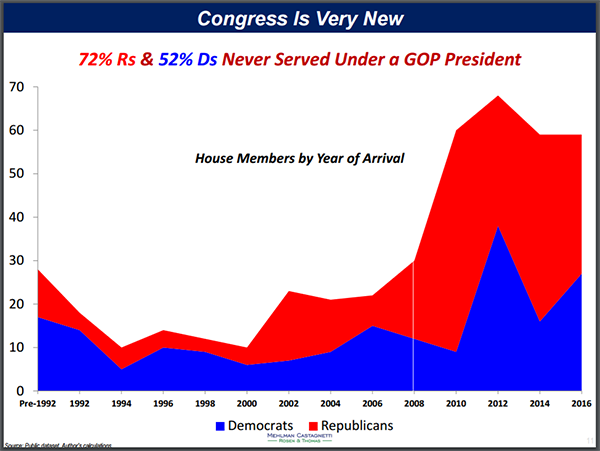 There are two slides from his most recent presentation we wanted to highlight: The first shows that despite very high reelection rates for members of Congress, there is still a considerable amount of turnover in the U.S. House. 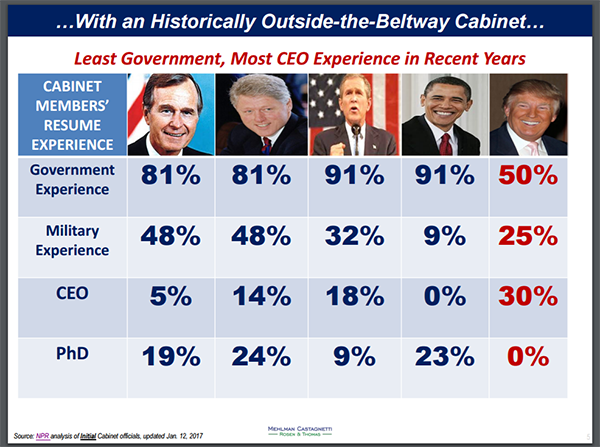 The second shows the relative inexperience of President-elect Donald Trump’s Cabinet choices, which is perhaps fitting for a candidate whose lack of government experience ultimately proved beneficial to his campaign. To see Bruce’s presentation, click here.